The most talked about harbinger of a recession is the inverted yield curve. 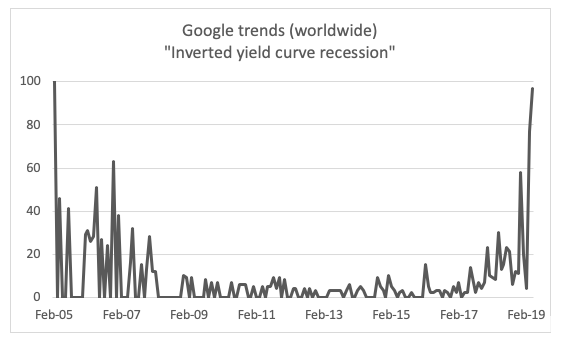 Google trends show recent internet searches on “inverted yield curve recession” have reached a fever pitch. It is interesting to note that in February 2005 the same search terms also reached extreme levels. Yes, a global recession did occur three years later in 2008. However, from February 2005 the MSCI world index rallied more than 40% to its peak in late 2007. Understanding how consensus thinks is important for identifying mispriced stocks. When everybody is on the same side of the boat it doesn’t take much for it to sway the other way when the consensus shifts. Think about the Aussie banks before and after the Royal Commission final report was released. Before the report was released, banks were priced for a negative outcome. When the final recommendations were revealed to be benign their share prices significantly rebounded. Similarly, when everybody is bearish about stocks because of an inverted yield curve, it may prove to be bullish because valuations are already priced for a slowdown. Consensus views can be canvassed through various means such as google trend searches, sentiment surveys, or short positions. At Vertium we rely heavily on valuations – when valuation multiples are high (low) we aim to understand why consensus views are positive (negative) and work out whether they are sustainable. It is easy to prove why starting valuations matter for long term returns. Just plot the Shiller CAPE index for the S&P500 against its subsequent ten-year return (inverted). 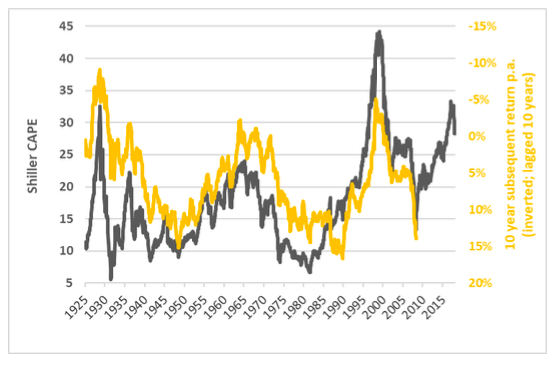 The chart highlights a near mirror image between the Shiller CAPE index and future returns. When valuations are low future returns are likely to be high and vice versa. Specifically, if stock prices are priced for negative outcomes then neutral or positive events are likely to lead to substantial re-ratings. Naturally, the reverse applies when the market is priced for perfection. Given the high valuation level for the S&P500, its next ten-year returns are likely to be very low. While the market multiple may be high, the current economic slowdown has lowered the valuation of many stocks. Investors currently fretting about a slowing growth environment should view it as a gift from the investment Gods. The key for investors is whether valuations are priced for a slowdown. In Australia, the economy is slowing. Credit growth is decelerating, and its economic tentacles have dragged many parts of the economy down such as lower house prices, falling car sales, and subdued retail sales. And there is increasing commentary about the Reserve Bank of Australia needing to cut interest rates to prevent a rising unemployment rate. Are stocks priced for a sombre economic backdrop? Yes and no. On our analysis, there is a large disparity among economically sensitive stocks. 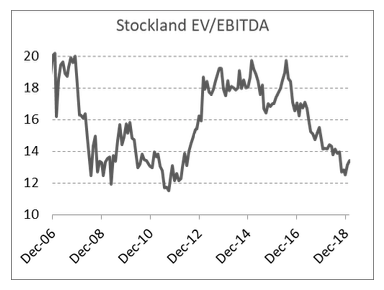 Stocks priced for shallow slowdown – valuation multiples are priced at the low end of their short-term range. Stocks priced for deep slowdown – valuation multiples are priced at the low end of their long-term range. Unfortunately, we do not have a crystal ball to exactly pinpoint where the economy is headed but based on valuations we have an idea of how the consensus is positioned. 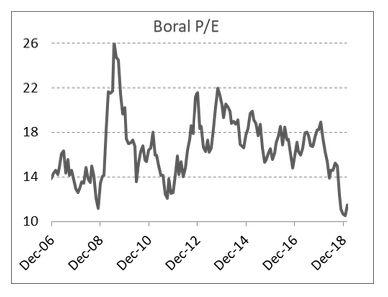 If you believe Australia is going to suffer a deep slowdown, Boral and Stockland’s share prices are not likely to rise. But every other stock on the market will likely collapse to catch up to their depressed valuations. 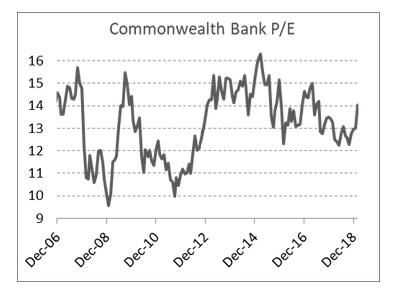 For example, the Commonwealth Bank’s share price could collapse by about 40% if it de-rated to 10x PE multiple (a deep slowdown scenario). 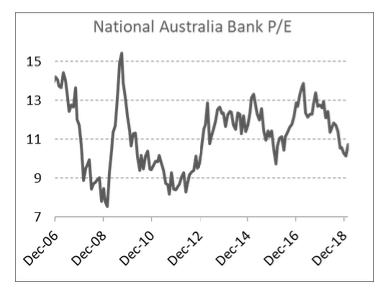 Alternatively, if the economy is headed for a shallow slowdown then stocks priced for a deep slowdown will likely re-rate. On the other hand, stocks priced for no slowdown will likely de-rate and stocks priced for a shallow slowdown will likely trade sideways. Are stocks with business models not sensitive to the economy more resilient investments? Again, their starting valuations will provide a clue about their future returns. Let’s use CSL (healthcare company) and Dexus (office REIT) as two examples. For industrial companies, valuation multiples should reflect the level of earnings growth. 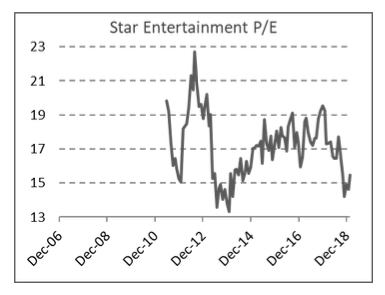 Since 2017, CSL’s PE multiple has diverged from its underlying growth rate. To bring it back to equilibrium, either its earnings growth must be revised up or its PE multiple must de-rate. 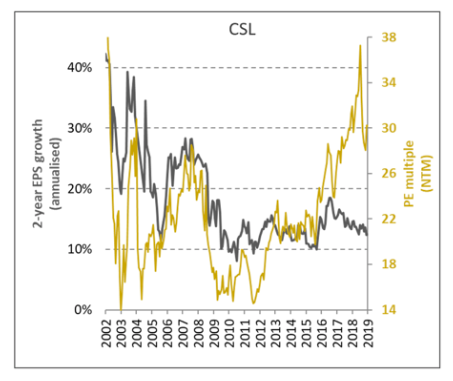 To highlight why sometimes short-termism prevails, a recent broker report highlighted that CSL is trading at fair value because its trading in-line with its 70% premium to the market (ex-banks) over the last two years. Does anybody question why the 70% premium is justified and why use the last two years as a comparative period? What about comparing its valuation over the last seventeen years? 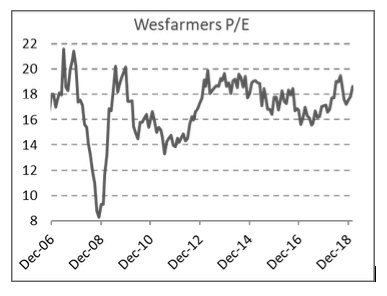 The last time CSL traded around 30x PE multiple was in the early 2000s when its forecast earnings growth was twice the rate compared to today. While REITs have low earnings growth, they offer more defensive earnings compared to industrial companies. A simple investment rule, that the market often forgets, is to buy REITs below their net tangible assets (NTA) and sell when they trade at a premium to NTA (the caveat is that their balance sheet is not over-geared). 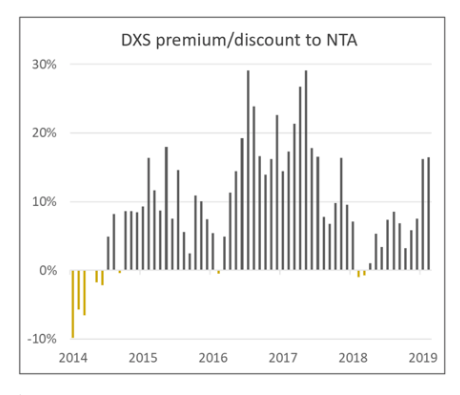 Hence, the best time to buy DXS was a year ago when it traded at a discount to NTA. Back then, the consensus narrative was global synchronised growth driving up interest rates, which could lead to NTA downgrades. Clearly, the opposite has occurred, and the consensus narrative now is that the global slowdown is driving down interest rates. DXS is currently trading at a substantial premium to NTA and is priced for perfection. The examples above highlight that the market often prices the dominant narrative at that time. In other words, the consensus has the propensity to focus on the short term and extrapolate the prevailing good or bad conditions. 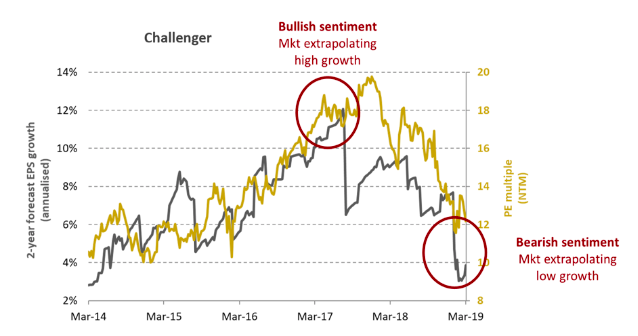 Challenger (CGF) is another example of the market extrapolating short term issues. About two years ago, the company was priced for perfection trading at 18x PE multiple. At the time, there were no short-term issues and a high valuation multiple was justified by the burgeoning cohort of retirees buying CGF’s annuity products. After its recent earnings downgrade in late January 2019, the stock collapsed more than 20%. The consensus earnings growth rate was revised down substantially, and the company is currently trading at 13x PE multiple. What happened to the bullish narrative on annuity sales? An inverting yield curve may scare investors away from equities. While it is prudent to prepare for an economic slowdown it should be done by reference to valuations. Valuations should be used as the yardstick to buy or sell equities not prevailing market narratives. When the world looked rosy last year, investors threw caution to the wind by ignoring valuations and extrapolated good times forever. Now in the foggy mist of an economic slowdown the same mistake may be occurring but in the opposite direction. Like bond proxies that were shunned last year, when expectations are very low for some stocks it sets the foundation for lower risk equity returns in following periods. Jason, what an excellent article. I've been drawn to investing because my study of the markets and other successful investors revealed that plain logic has and will always prevail. It seems needless to point out that valuations matter, but I've found that even sophisticated investors find sophisticated reasons to forget about the most obvious truths. It was great to see this fundamental message shared with clear examples.